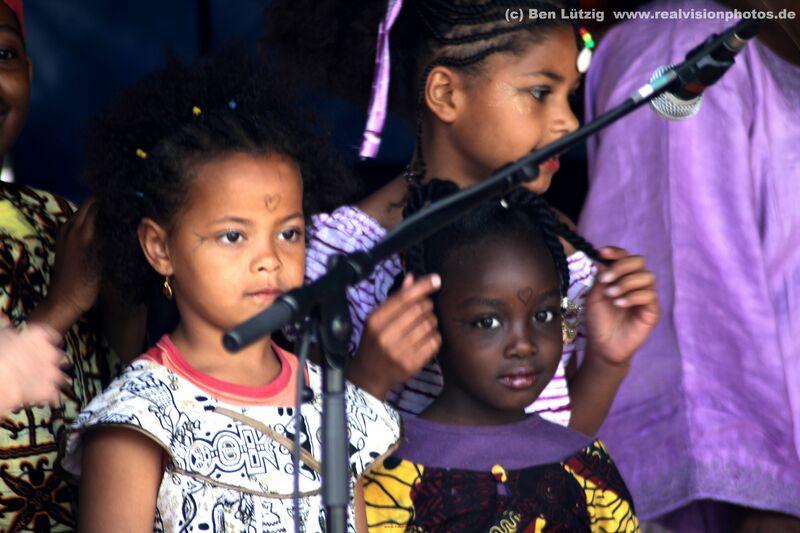 Global New Generation is an Afro-European children musical group. Each year under the leadership of African artists about 15 multi-ethnic children creativily develop a new children’s musical play. The screenplays are usually based on historical and political facts. The children learn traditions of different African countries through music and dance. It is a true joy to watch the children in a performance. New Generation also offers childcare at festivals. You can book for Creative Workshops such as “Draw your Africa”, mask crafts and face painting. The Initiative “New Generation” has existed since Jan 2008 started by artist, Sonja Prinz. The foundation is for talented youth with passion in music, dance and theater in an intercultural environment. The Organisation intergrates the inspirational medium of the African culture. As the multiethnic population develops politically, GNG wishes to encourage and engage other cultures to merge socially. The plays are about 40 minutes and contain different languages, tradions, politic, geographic aspects focused on one african country.